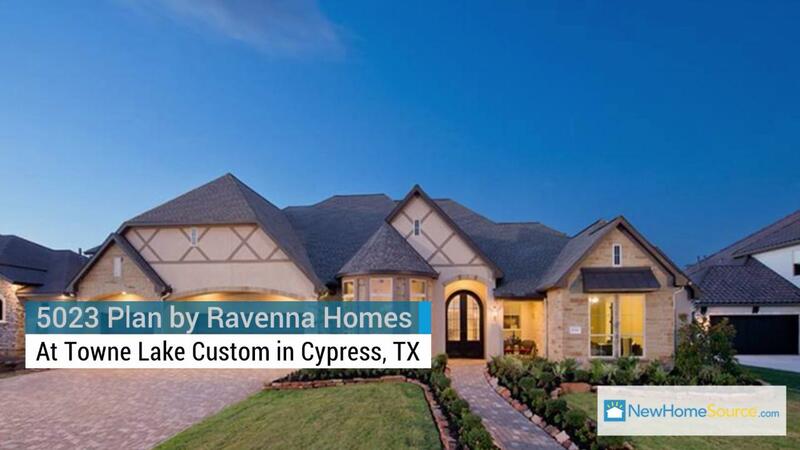 Everything is bigger in Texas, including a 5,023-sq.-ft.- home plan by Ravenna Homes. The 5023 plan by Ravenna Homes in Cypress, Texas, is the perfect example of how you can live big in Texas, without the hassle and maintenance tied to a used home. At more than 5,000 sq. ft., the four-bedroom, four-and-a-half-bath home is as elegant as it is spacious. With a castle-like exterior with turret-like features, you’ll have more than enough space for your family to spread out in the 5023 plan, and you’ll also have lots of space to host guests and entertain. Functional spaces such as a mud room and a home office will ensure the home stays clean and organized. This model home is stylishly curated with interesting design choices, giving buyers an idea of what they can do to make their home both functional and sophisticated. Just to the left of the home’s entrance is a space that’s ideal for a formal dining room. Buyers could use this space as a flex room, too. A spacious great room opens to a breakfast area and an open kitchen complete with a circular kitchen island. The island is a nice touch, as it creates a warm space in an open floor plan where families can easily congregate. The home’s master suite is well-appointed and has options that can make it the ideal retreat when a challenging day demands ways to unwind. Other 5023 plan features include a game room, play room, and vaulted ceilings. The home’s covered patio offers a good way to enjoy the home’s outdoor space and take advantage of good Texas weather (dine alfresco!). What’s It Like Living at Towne Lake Custom? Towne Lake Custom is a new-home community in a tight-knit community with lots to do. Waterfront lots mean buyers can enjoy some aquatic recreation, while a green belt and pond provide stunning scenery. A park and playground, in addition to a community center, make it easy to meet and socialize with neighbors. The Houston suburb of Cypress is close to the action, but far enough away from traffic and the hustle and bustle of one of the nation’s largest cities. Want to see more photos of this beautiful home? You can learn more about the 5023 plan, the Town Lake Custom community where it’s located, and see more homes by Ravenna Homes on NewHomeSource. If there’s anyone who knows a builder’s homes well, it’s the on-site sales staff. Not only are they there to sell you the right home for your needs, they can answer many questions to make the process simple. Don’t neglect this helpful resource when you purchase a newly built home. Did you know you can tour a new home without leaving the comfort of your bed? Enter the virtual reality home viewer, a new way buyers can check out homes that have yet to be built.